THE ANSEL ADAMS WILDERNESS spans an area of 231,533 acres. 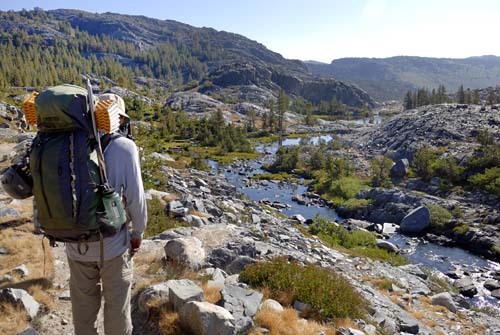 Elevations within the wilderness range from 3,500 ft at Hells Half Acre along the Middle Fork San Joaquin River, to 13,157ft at the summit of Mt. Ritter. It is arguably some of the most beautiful landscape to be found anywhere in the world. The wilderness was renamed from the Minarets Wilderness to honour the famous landscape photographer and environmentalist by the 1984 California Wilderness Act. The 1984 law also more than doubled the size of the Minarets Wilderness, extending it south from its original southern boundary in the vicinity of Hemlock Crossing and Devils Postpile all the way to its current extent near Lake Thomas Edison. Mt. Ritter and Banner Peak along with the Minarets are awe inspiring for climbers and outdoors men of all types. John Muir considered the alpine beauty in this area to be unsurpassed by any other terrain in all the range. He also considered Ediza Lake to be the most beautiful of all the multitudes of lakes in the Sierra. The 10,591 ft level gives you a good idea of the weather conditions at camping spots such as Thousand Island Lake, Garnet Lake, and Ediza Lake. Timberline Trails recommends REI for all your hiking, backpacking, climbing and mountaineering needs. They carry all the major brands and stand behind everything they sell with one of the best guarantees you could ask for in outdoor gear. April 19 Friday Night Cloudy, then gradual clearing toward daybreak, with a low around 28. Breezy, with a southwest wind 10 to 20 mph, with gusts as high as 25 mph. April 20 Saturday A 40 percent chance of snow showers. Mostly cloudy, with a high near 36. Breezy, with a southwest wind 15 to 25 mph. April 20 Saturday Night A 20 percent chance of snow showers before 11pm. Mostly cloudy, with a low around 20. Breezy, with a southwest wind 15 to 20 mph becoming west 5 to 10 mph after midnight. April 21 Sunday A 30 percent chance of snow showers after 11am. Increasing clouds, with a high near 33. North wind 10 to 15 mph. April 21 Sunday Night Partly cloudy, with a low around 21. North northeast wind around 15 mph. April 22 Monday Sunny, with a high near 40. Breezy, with a north northeast wind 15 to 20 mph. April 22 Monday Night Clear, with a low around 25. Northeast wind around 15 mph. April 23 Tuesday Sunny, with a high near 45. Northeast wind 10 to 15 mph. April 23 Tuesday Night Mostly cloudy, with a low around 28. Northeast wind around 10 mph. April 24 Wednesday Sunny, with a high near 48. Calm wind becoming southwest around 5 mph in the afternoon. April 24 Wednesday Night Mostly clear, with a low around 29. Southwest wind 5 to 10 mph. April 25 Thursday Mostly sunny, with a high near 47. Southwest wind around 10 mph. April 25 Thursday Night Partly cloudy, with a low around 28. South southwest wind 10 to 15 mph. April 26 Friday A 20 percent chance of snow showers. Mostly cloudy, with a high near 42. Southwest wind 10 to 15 mph. When I consider your heavens, the work of your fingers, the moon and the stars, which you have set in place, what is man that you are mindful of him, the son of man that you care for him? You made him a little lower than the heavenly beings and crowned him with glory and honor. You made him ruler over the works of your hands; you put everything under his feet: all flocks and herds, and the beasts of the field, the birds of the air, and the fish of the sea, all that swim the paths of the seas. O LORD, our Lord, how majestic is your name in all the earth!